Jeff Brohm left his baseball career early and pursued another one, a football career. A season into that career in January 1995, Brohm was a scout team quarterback for the San Diego Chargers with a good seat for the Super Bowl. "It's tough," Brohm told The South Florida Sun-Sentinel. "But it's something you have to go through. I can't expect too much. I'm just going along with the flow. It's been a learning experience and I'll be ready when the time comes. And I get to go to the big show (Sunday)." Brohm went on to make it into eight National Football League games between 1996 and 1997. He's also gone on to a career as a college football coach. All that came after a brief baseball career where Brohm saw parts of two seasons in the minors- 51 total games. 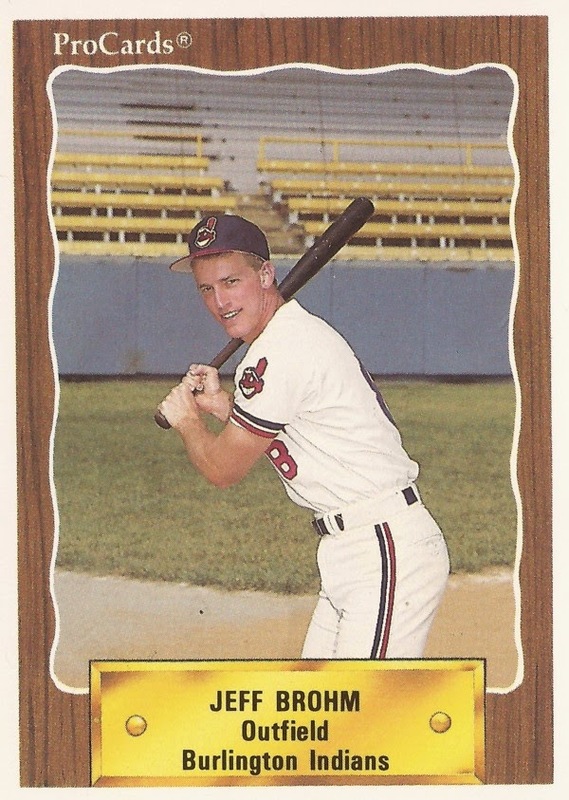 Brohm's professional baseball career began in 1990, taken by the Indians in the fourth round of the draft out of Louisville. Brohm played his first season at rookie Burlington. He hit .213 in 34 games. In 1991, Brohm moved to short-season Watertown. He got into 17 games, hitting .217. Brohm then left his baseball career behind and returned to Louisville, serving on the football team as quarterback. He also broke his leg two games into the 1991 season, returning for 1992. "It was tough sitting on the sidelines," Brohm told The Associated Press that August, "especially with the way the team was doing. But that year's behind us now." Brohm ended up throwing for more than 2.000 yards that year for Louisville and more than 2,600 the next. He threw 20 touchdowns that second year. Brohm then turned pro. He first worked with the Chargers. Then, in 1996, he played with the 49ers. He got into three games that year, throwing one touchdown - to Terrell Owens - and no interceptions. He got into five more games for the 49ers in 1997 without a touchdown, marking the extent of his NFL career. In 2001, Brohm tried his hand at the short-lived XFL with the Orlando Rage. He also spent the final week of the 2000 season as a backup with the Browns, but he didn't get in the game. Brohm then returned to Louisville, becoming head coach in 2002 for the AF2 Louisville Fire. He served as an assistant coach for the University of Louisville from 2003 to 2008. After going through three other schools, Brohm landed at the University of Western Kentucky, first as an assistant then, in 2014, in his first job as a college head coach. "Coach Brohm is the perfect players' coach," WKU quarterback Brandon Doughty told The Louisville Courier-Journal in April 2014. "He understands that things aren't perfectly scripted like you script them all week in practice. Having a coach that understands that things happen in games is awesome."